The houses in Ham Farm Road were built between the mid and late 1950s although two of the original properties have been replaced since the millennium. This road follows what was once the boundary of Ham Farm Nursery with Ham Common leading from Upper Ham Road, South of St Andrew’s Church and ending at Parkleys. Ham Farm Road and Parkleys form a horseshoe leading from and to Upper Ham Road. Ham Farm Nursery had been managed by two generations of the Walker family, tenants of the Dysart family since the mid 1880s. The family lived in the large 19th century farmhouse adjacent to Oak Lodge. After the Second World War the Dysart family’s estate management company Buckminster Estates sold most of the family’s Surrey estate. James Walker (the younger son of the original Walker tenant) bought Ham Farm Nursery on 19th July 1949. This sale was part of almost 50% of the Dysart’s Estate sold prior to a public auction held in London on November 5th 1949. 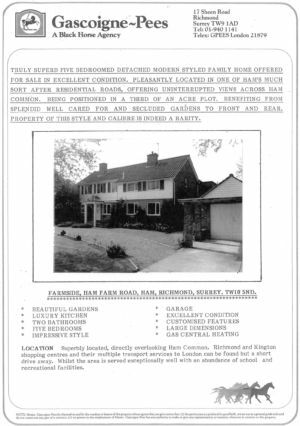 On 30th March 1953 James Walker sold Ham Farm Nursery to Bargood Estates, a development company. 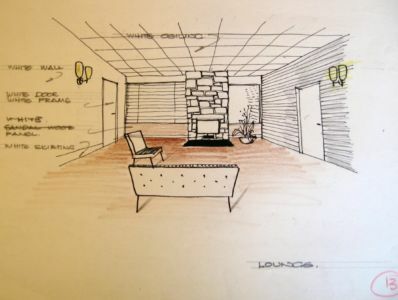 This company evolved and became known as Span Developments in the late 1950s. Between 1954 and 1955 Bargood Estates began building the fifteen blocks of flats which eventually became known as Parkleys. 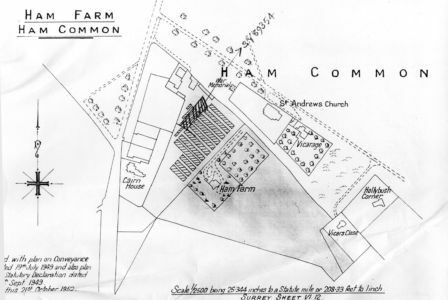 The plans for this estate did not include a piece of land abutting Ham Common which contained the farmhouse, most of the nursery’s glasshouses and some of the orchard. This land was divided into 17 house plots, each of which was sold for what is believed to have been about £1,500. 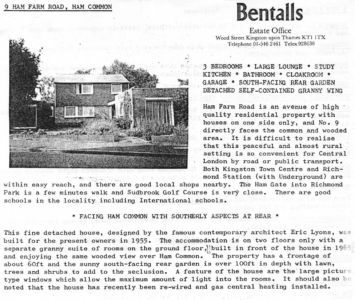 Bargood Estates committed to provide vehicular access for the newly built houses once building works had been completed; the resulting road was named Ham Farm Road and was adopted by Richmond Council in 1956. Oak Lodge, the large house on Upper Ham Road, had been damaged during the Second World War. Post war it was repaired and divided into two separate homes. One part retained the original entrance door facing Upper Ham Road; the other dwelling faced Ham Common and became 1, Ham Farm Road. James Walker built a new house on the site of his former home and took up residence during 1956. Although James Walker’s house was originally known as ‘Farmside’ it is now known as 3, Ham Farm Road. Eric Lyons had been employed by Bargood Estates to design Parkleys. 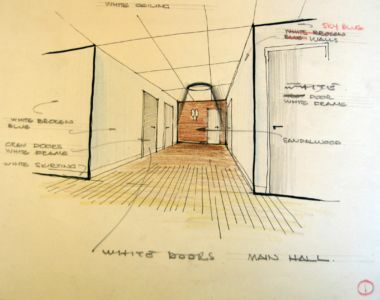 Each set of plans for the Ham Farm Road houses had to earn his approval; he charged 10 guineas for his services. No building work could begin until the plans had been ‘passed and approved’. 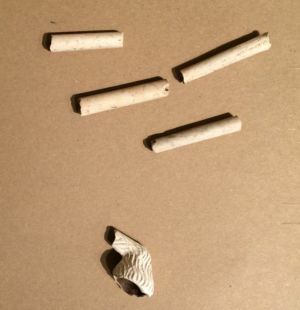 ‘…that being the net cost of materials and labour’. He was particular about any shadows cast on his home and garden by the houses or trees; there were strict conditions relating the heights of all new buildings and planting near to his property. All the Ham Farm Road houses were subject to the post war restrictions on size; however the owner of what is now 11, Ham Farm Road was allowed a larger house because he was a doctor. Plot 1 (this became No 7, Ham Farm Road) was not sold until 29th May 1956. The late owner Tilly Odell believed that originally the plot had been intended as an additional communal garden for the Parkleys development. The architect Leslie Gooday was commissioned by Frank and Tilly Odell to design their new home; in 1961 this architect designed the swimming pool and leisure facilities, ‘Pools in the Park’ in Old Deer Park, Richmond. Plot 2 was sold to the film director Norman Castle Hemsley (son of the music hall star Harry Hemsley) and his wife Elizabeth. Their purchase was completed on 30th March 1953, the same day that Bargood Estates completed its purchase of Ham Farm Nursery. 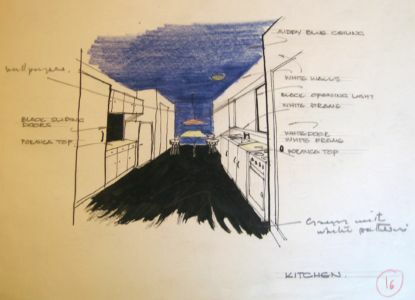 The Hemleys employed Eric Lyons to design their home; he used the same design of windows and kitchen units as he had used for the Parkleys flats. The house has his trademark tile hung facade. Materials were in short supply at the time of building but according to Elizabeth Hemsley, Lyons excused the motley brick types used at the rear of the building saying that they would add extra character to her property. This house and those nearby were built on land where once rows of greenhouses separated by cinder paths had stood; their remains continue to prove a challenge for gardeners. Those living at the other end of the road (i.e. houses with higher numbers) were fortunate to have gardens on land that had once been orchards. No. 4, Ham Farm Road was a bungalow with a separate guest annexe, built at right angles to the main dwelling, above the garage. This was the home built for Hamish and Helen Thompson (a dentist and actress respectively). Its second owners demolished the building and circa 2004 replaced it with a house designed by Paul Brookes Architects; this house featured on a Channel 5 TV programme ‘Supermodels’. At the time of writing the original house No. 6 has been demolished and is being replaced with a Huf Haus. In 2003, along with the Parkleys Development, Ham Farm Road was included in the Richmond upon Thames Conservation Area No 67. Numbers 7, 9 and 21 have recently been named as Buildings of Townscape Merit by Richmond upon Thames Council. With thanks to Trish Cape, Sue Odell, Jude Clark for the loan and use of their documents. Thanks to Jill Marber and Diana Miller for sharing their knowledge of Ham Farm Road. Information recalled from conversations I had with those past residents and dear friends from Ham Farm Road who had been happy to share their memories with me: Frank and Tilly Odell; Norman & Elizabeth Hemsley and Helen Thompson.